FQB "Cherish" Collection celebrates everyone and everything that you cherish in life. Be it a person, place, thing or event our Cherish Collection is the perfect way to capture the emotion of these treasures in your life. The soft blues and pinks that flow throughout this digital kit will give you a blissful feeling to let your creativity flourish in designing your scrapbook layouts, cards and mini albums! 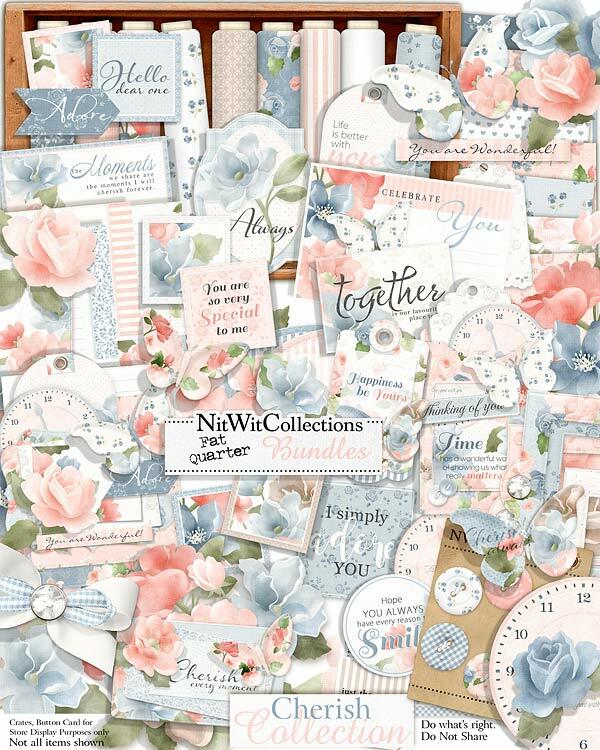 Beautiful and graceful elements from the florals, butterflies and envelope cluster to the journal cards, clock and labels, you will be able to compose so many different items that we hope this will become your favourite Nitwit Collections™ kit. Dream of your most cherished moment and then begin....we know you won't want to put this kit down!! 1 Border of vertical flowers that is so easily placed into your cards, mini albums and scrapbook layouts and just watch the results take shape! 1 Clock face without the hands....timeless?? 1 Journal card - "I Simply Adore You"
1 Label with a flower cluster as its focal point...as pretty as a picture! 1 Label - "Hope you always....."
1 Sentiment card - "Together...."
1 Square - "Hello Dear One"
1 Square - " You are so very Special to me"
1 Tag element - "Happiness be Yours"
1 Tag element - "Life is Better with You"
1 Topper - "Cherish Every Moment"
1 Topper - "You are Wonderful"
1 Wordstrip - "You are Wonderful"